The government is expected to roll out its policy on flying drones in India in the ongoing month, aviation secretary RN Choubey told. The government is expected to roll out its policy on flying drones in India in the ongoing month, aviation secretary RN Choubey told. He said his ministry would then follow up the policy announcement with the setting up of a “large taskforce” to look into ways of incentivising manufacturing of the unmanned aerial vehicles in India. “We have been engaged with security agencies for the last one year. I am expecting the policy to be announced this month itself. The policy will be about usage of drones. Normally, our ministry doesn’t look at manufacturing but after the policy announcement, in this case, we will also set up a large taskforce of experts to look into their manufacturing locally,” he said in Hyderabad. Choubey is in Hyderabad to address the four-day aviation summit ‘Wings India 2018’ that starts on Thursday. The Directorate General of Civil Aviation had in November last year floated the draft of the proposed policy. A key component of the draft was the height – 200 feet from ground level – above which operators won’t be allowed to fly their drones. Many felt this would severely limit the usage as the international practice was 400 feet. Companies with large factories, power plants, refineries and transmission lines have had drones deployed at their industrial establishments but no policy on their commercial deployment and usage has existed so far. 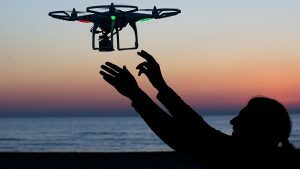 The policy will formalise a licensing structure on and who and who can’t fly drones besides marking areas where they can’t be deployed like borders and other strategic and sensitive areas. Under the proposed rules, the regulator had classified drones under five categories based on their weight. Nano drones – weighing less than 250 gms and flying at a height of up to 50 feet from the ground level – will not need any permission.